Add some fun to your winter! Attend Chapel Theatre in Milwaukie's monthly Second Sunday performances. Chapel Theatre is partnering with Milwaukie ArtMOB to bring the spirit of Milwaukie First Fridays indoors during the winter. From January through March, Chapel Theatre will offer the Second Sunday Winter Performance Series, offering a varity of performance styles in an effort to engage audiences with various art forms in a warm, community-centered environment. The events will range from at-risk youth showcasing their art and breakdancing to musical theatre to local choreographers pairing their dance pieces with wine tasting. Each event will be unique and engage audiences in very different ways. All events are held at Chapel Theatre, 4107 S.E. Harrison St., Milwaukie and start at 6 p.m. Tickets are available online at chapeltheatremilwaukie.com. Jan. 13: The Ingenue's Revenge: A Musical Cabaret. This event is a reprise of a musical theatre cabaret event that took place at Chapel Theatre summer of 2018. Three of Portland's top musical theatre performers strip away the lace and tiaras to reveal a much more complex picture of maidenhood. 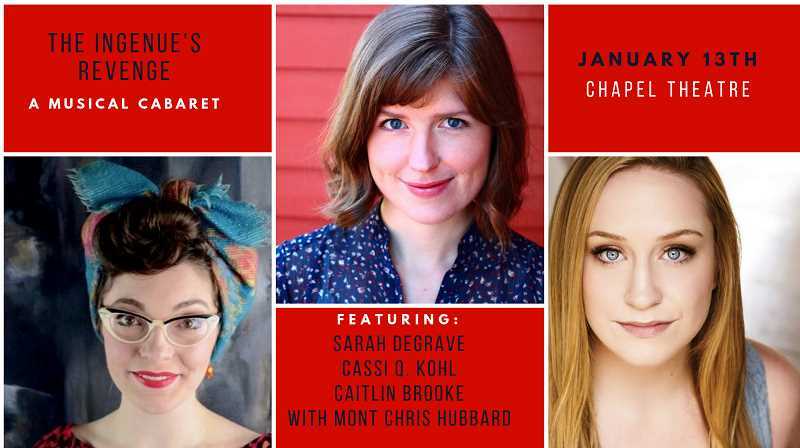 Jam-packed with classic and contemporary showtunes, this fun and thought-provoking concert features Sarah DeGrave, Cassi Q. Kohl and Caitlin Brooke with accompaniment by Mont Chris Hubbard. Feb. 10: Hip Hop Culture Exhibition: Graffiti Art & Breakdancing. Youth from Morpheus Youth Project and Mayfair Art will showcase their graffiti art and breakdancing. This event will include a battle-style breakdancing performance accompanied by a DJ and live painting. March 10: A Taste of Dance: A Wine & Dance Pairing Performance. This last event in the series involves dance pieces that will be paired with wine for audience members to engage in the arts with multiple senses. Each choreographer will describe their artistic process and their artistic choices for their pieces. The sommelier will then describe the wine chosen to pair with each piece, why it relates to the artistic expression of the dancers and how the audience might experience the taste in relation to the art. Tickets for the February and March events will be available soon.